At this time of the year I love to have a vase of tulips in the house. They are the only flowers I love for the whole of their time in the vase - from the minute they are taken from the wrapping, all tight in bud, crisp and fresh until their very last straggly droopy day before they go. (Didn't the chap in Calendar Girls say this too? I need to check the DVD!) 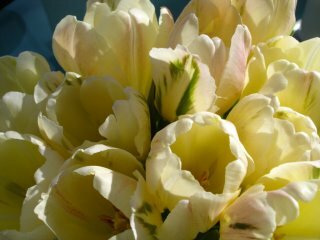 I think this week's bunch of tulips are particularly lovely and the markings on the petals quite remarkable. 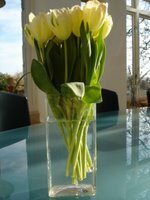 I have intended, for some time, to take a daily photograph of a vase of tulips, to record every stage of their progress, from fresh-in to throw-out. This seems like a good bunch to feature.